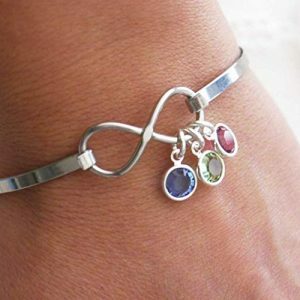 The 10 Best Birthstone Bracelets to Match that Birthstone Ring You Love! 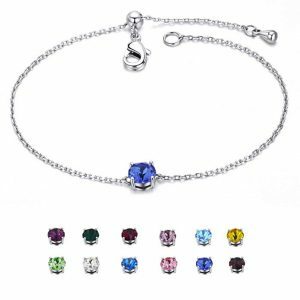 We have located ten of our favorite birthstone bracelets to pair with that birthstone ring you already rock on the regular. If you are one of the lucky folks with more than one stone to choose, perhaps pair one of your alternate stones with your ring to get the full spectrum of stones available to you! Or chose the birthstones of your loved ones to celebrate their importance in your life! This is the best of both worlds as far as a bracelet style goes. It is a cuff bangle and a charm bracelet all wrapped into one. A simple piece of stainless steel ties itself into a knot along the top of the wrist. From this knot hangs a simple round cut simulated stone in your choice of birthstone varieties. We love that the creators chose to make the bangle in a cuff style. It means that you can adjust it gently to your preferred fit. Wear it fairly snug to keep it style and control the location of the charm on your arm. Or wear it loose to it spins and adds motion to your jewelry collection. This bracelet is great for wearing with other bangles, particularly wire bangles. Make the look big and chunky by donning a whole arms worth of them. 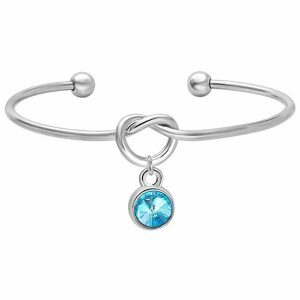 This one will add a pop of color with the birthstone charm. A second of our selections that offers just one color of stone. This one is also a cuff style bangle but with a wonderful variance in the presentation. This gold-plated alloy wraps around the wrist to end at two brilliant rhinestones in your choice of simulated birthstone. This is a interesting take on the cuff bangle as most of the time the open portion of the bracelet goes along the inside of the wrist. Instead you wear this on the outside of the wrist so the jewels are visible, given an interesting twist to a traditional wire bangle. This is another piece we adore for layering with other wire bangles. Because of the yellow gold tone, combine it with other pieces of yellow gold for the best effect. That will make your birthstone selection really stand out. Do not be afraid, however to pair this with a birthstone ring in white or rose gold. Once a fashion faux pax and absolute no-no, combining gold tones is not only acceptable but trending. 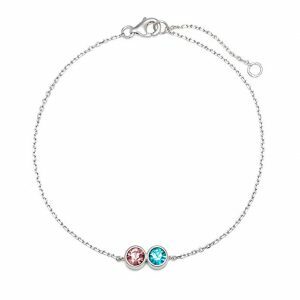 We have a new-found passion for dainty bracelets nowadays so naturally, we have included a dainty birthstone bracelet on our list. This bracelet is simple and unassuming. A silver chain clings to a prong-set simulated birthstone. The bracelet closes with a lobster claw and includes a decorative jewel shaped bead to cap the chain as well. 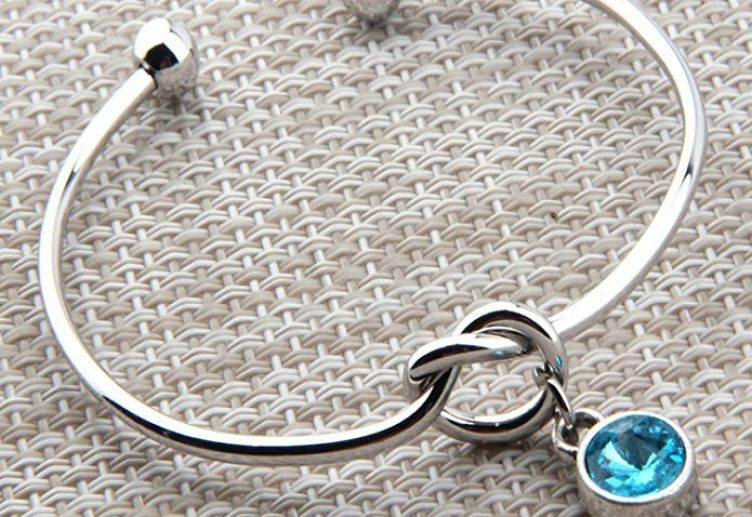 This is absolutely a daily-wear bracelet and the perfect match for any birthstone ring. Wear it with other bracelets to let it blend in or wear it solo. The simplicity will make it stand out by itself. This is, essentially, the epitome of less is more when it comes to jewelry design. The jewel will add a pop of color and glitter while the chain will add just a little bit of movement to the piece. We recommend wearing this piece as loose as you feel safe on the wrist. This will keep a nice, light feel to the styling. If you are not buying this for yourself, this is a cannot-go-wrong gift for a baby’s naming celebration, baptism, christening or birthday. While tennis bracelets are most traditionally done up in diamond, we are making an exception to the tradition with this creation by Gem Star USA. A row of Swarovski crystal in your choice of birthstone simulates reaches around the wrist to close with a bolo style closure. It is both simple and stunning. Unlike our previous selection, there is nothing understated about this, despite its uncomplicated design. The row of stones sparkles brilliantly and we are suckers for a well used bolo closure on a bracelet. Done well it adds movement and really is its own element of design. Most often the closures of a bracelet are simply hidden or ignored entirely, leaving an unsightly claw or c-ring exposed. 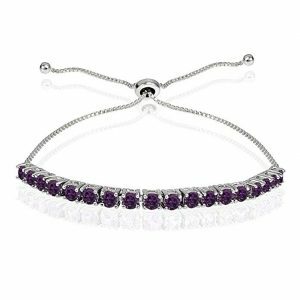 Bolo closures are our favorite for a chain style or charm style bracelet such as this birthstone tennis bracelet. This is certainly a solo piece as we believe pairing it with others would only serve to detract from both the tennis bracelet and your other pieces. Of course it is almost a requirement we add an Eve’s Addiction piece on our list. Once more this is a dainty bracelet that does not need a lot going on to look amazing. This bracelet is a rhodium-plated silver with a lobster claw closure. Our example offers two bezel set simulated birthstones of your choice. You can select you and your significant other’s, your two favorite colors, the stones of your children, grandparents, or other special people in your life. Eve’s Addiction also offers bracelets that feature one, three, four, and five bezel set stones if you need a little more space to celebrate. As per our standard recommendation for dainty bracelets, we recommend a solo look for this one. The simplicity is just enough to really work as an elegant addition to any piece. If we are going to have an Eve’s Addiction piece we must also include Alex and Ani. 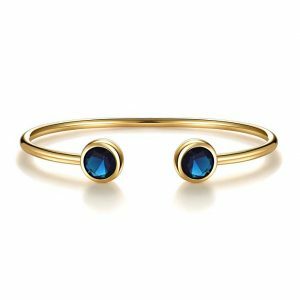 This is their classic and patented adjustable bangle design feature a sizeable crystal in your choice of simulated birthstone. That with their three standard charms and the bracelet is complete. They have this look down to such a science over at Alex and Ani, it really does not need anything more than that. The bangle is available in both the yellow and white gold-tone so you can purchase to match or oppose your birthstone ring. And this bracelet, while it is pretty simple and rather dainty, is great for matching with other bracelets. We are fans of rocking an arm’s worth of Alex and Ani but this will also look great as a mixed media look. Pair this metal and charm piece with leather, fabric, canvas and stone beads to really make the most of it. The fiber and textile textures will make the metal and gem charm really pop. Plus the charm will add a bit of movement in case the other components do not offer that function. Another bolo style bracelet, this one goes above and beyond. It offers your choice of five different birthstones. You can select to have all five of the same stone or repeat a stone or two if you do not want to feature five different stones. Most importantly, this is the first one our list to feature real gemstones as opposed to lab created or simulated stones. Brilliantly selected oval cut gems shine from prong settings on a 925 Sterling Silver bolo style bracelet. Each stone is separated by an infinity symbol in silver adorned with a glistening cubic zirconia stone. This has all the glitz and glamour that fine jewelry should! This is most definitely a solo piece, best worn with nothing longer than a three-quarter sleeve. By design, this will work with day or evening looks. It is a perfect gift for a mother or grandmother featuring the birthstone of all of her children or grandchildren. Speaking of bracelets that are not only great to match your birthstone ring but begging to be gifted to a mother or grandmother, we found this treasure. Handmade by an artisan out of California, Dots of Sugar leaves a lot of room for personalization on this Alex & Ani inspired adjustable bangle. You can select up to ten charms to include a custom engraving up to twenty characters. Each of those charms includes a birthstone charm on the same fitting. Each double layer charm provides shine and sparkle in one. You can absolutely engrave the names of children or grandchildren but you can also elect other information. Birthdates, nicknames and other special information is perfect for this bracelet. You might even choose this for a pet lover to celebrate their four-legged (or two-legged…or no-legged) friends. We love this as a solo piece or in conjunction with other wire bangles. 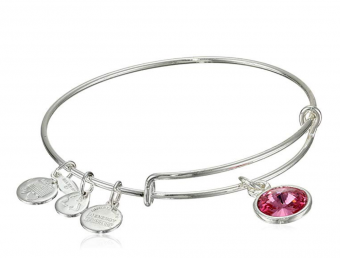 Styled after the Alex and Ani design, the bangle is adjustable via an innovative wire wrap design. This next one is our most traditional version of bangle on our list. 925 sterling silver creates a beautiful band that latches to an infinity symbol. 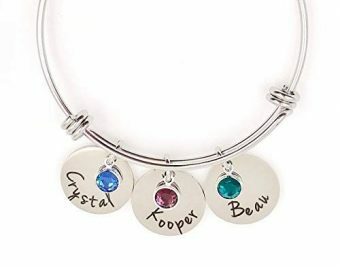 From one loop hangs your choice of one, two, or three silverplated Swarovski crystals in birth month colors. These crystals are translucent and not caught in a traditional setting so the light passes through them beautifully. Each crystal is wrapped delicately in sterling silver and hung so the light can shine through it. They are still faceted so they catch the light and cast tiny little color shadows across your skin. It adds a stained glass effect to the already beautiful crystals. This one may very well be our favorite find on this list. This one is a great solo wear option. While it feels graceful enough, it does not really carry the evening wear aesthetic. We strongly feel it will work better with business wear and casual looks. You can select your birth month and those of your significant other. For a beautiful relationship focused piece select your birth month, the birth month of your significant other, and the stone for the month of your anniversary. This takes the birthstone concept to a higher level and we love it! Our final picks takes the birthstone concept and goes straight over the edge with it in the best way possible. 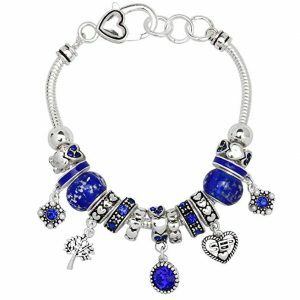 Not only does this Pandora inspired bracelet have your birthstone, it includes a charm with the month and several color-matched beads in the appropriate color. Crystals, hearts, enamel, and glass work together with silver-toned alloy to create a stunning and busy piece. It is a wonderful departure from our previous simple, understated picks. 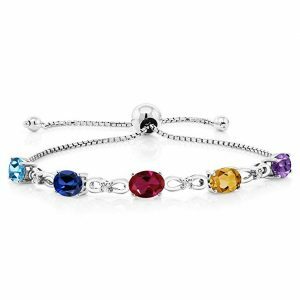 This truly is a celebration of a birthstone in a bracelet and is sure to complement your ring perfectly! Birthstone jewelry had been a constant for many decades. There are countless stories as to how we came to assign a stone to a birth month. The most popular version dates back to the breastplate of the biblical figure, Aaron. His armor is said to have been adorned with twelve stones, one for each of the twelve tribes of Israel. This breastplate, which was apparently stored in The Second Temple in Jerusalem is said to have included emerald, sapphire, diamond, topaz, carbuncle, sardius, agate, ligure, amethyst, onyx, jasper, and beryl. This shifted to something called the Foundation Stones due to the work of a St. Jerome. From the tribes of Israel, the twelve differently colored stones came to represent the twelve apostles of Jesus Christ. Each apostle was assigned a month in the Julian calendar and each apostle had a specific stone tied to them. The apostles each represented a different virtue. It became a sign of that particular virtue to wear the stone and color of each apostle during that month. Generally, historians disagree when this shift and habit started. 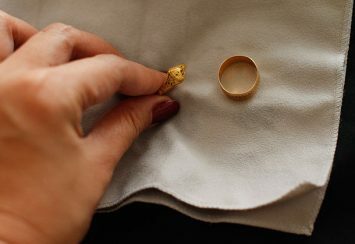 According to the Gemological Institute of America, the tradition may date back to the late sixteenth century in Germany. Noted historian George Frederick Kunz argues it started in the early nineteenth century in Poland. No matter its start date, the tradition did leave its mark on history. By the early twentieth century, confusinghistories and conflicting explanations of month stones had muddied the water quite a bit. An effort create a unified list was undertaken. Members of the American National Association of Jewelers assembled in Kansas in 1912. They pieced together a single list of precious and semi-precious stones assigned to each month. Critics of the Kansas list claim that it was nothing more than a marketing ploy to increase jewelry sales. Whether it was or was not, the list absolutely stuck and a wide and sticking trend in jewelry was created. Modifications have been made over the years and the same list has been adopted by several other countries including Great Britain. 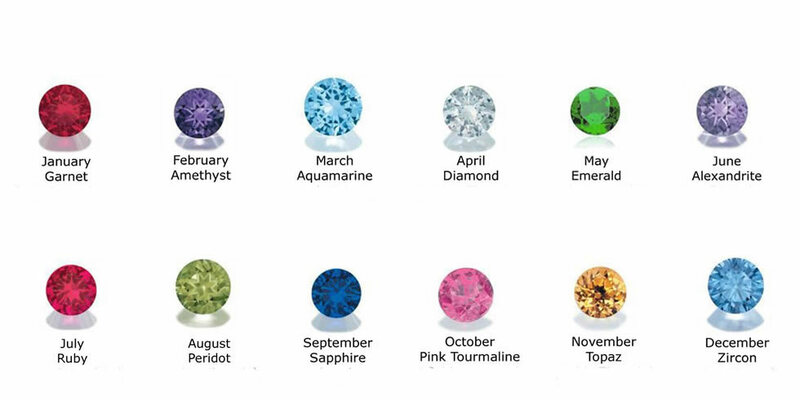 For those folks with more than one birthstone named for their month, decision-making can be a challenge. Most people end up selecting one of their multiple options and sticking with it for consistency’s sake. This is, by no means, a required element of wearing birthstone jewelry. There is also some variability in the months with multiple stones. Depending on what list you find, some months include more than one stone to select at your discretion. For instance, while we listed October is Opal and Tourmaline, rose quartz is often associated with October. Bloodstone is sometimes offered for March. June sometimes includes moonstone. These lists are not governed by any one body and while most people tend to agree and offer their creations accordingly, there can be some variability. So much so, that we may not have mentioned the stone you call your own birthstone in our list. If we did not, that’s okay! It does not mean it is not your birthstone, it just is not a common inclusion in most birthstone lists. Additionally, if you are a fan f emerald but born in October, wear the emerald jewelry! Here at Jewelry Jealousy, we are always fans of wearing what you love no matter the rules. These are guidelines or suggestions at best. You should feel no compulsion to wear a stone or color collection you do not love just because it is your birthstone. You can always use the meanings of the stones as outlined above when choosing a stone as well. If you feel a closer kinship to the meaning of garnet, that could be your stone of choice. Your jewelry and fashion choices are a direct representation of your personality. If you do not feel you represent the ideals and symbology of the September stone, even though your birthday falls in September, no worries. Wear what you love!